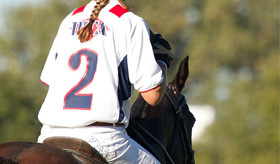 One of the truly unique characteristics of polo is that it is a sports party that showcases the finest in Spring and Fall fashions. Both female and male attendees pull out all of the stops when selecting their apparel, weather permitting! There are no hard and fast rules; however, ladies typically wear sundresses or bold separates that coordinate with their accessories. Heels are not recommended as you will walk on grass and gravel, wedges or flats make your trek easier. Men usually promote a dressy casual style with pants or jeans. Dressy shorts for men only as the temperatures warm up. No – Outside food and drinks are not allowed. Ruth’s Chris serves delicious food and drinks on both sides of the field. Can I bring my own lawn chair? No –Tables and seating are provided. Can I bring my own flash photography? No – Outside photography is not permitted. We have onsite photographers and their photos can be seen and purchased on their website. You may find direct links to their website under our Gallery tab. Yes – Tickets will be available for purchase at the gate. We recommend checking the website at least 24 hours prior to scheduled game time for any weather and sell outs. Are small children allowed? What ages constitute a child’s ticket to be purchased? Is the facility wheel chair/stroller accessible? Dogs are not allowed during Sunday Polo. Service dogs are welcome. Parking for Sunday polo is complimentary. Parking attendants are onsite to direct you to the appropriate parking areas.